With such beginnings, it's hardly surprising that Pattaya quickly gained an image as one of Thailand's seedier beach resorts. However, in recent years the local authorities have made considerable efforts to clean up Pattaya's image, even though that has generally meant adding more family-oriented attractions rather than just getting rid of the seedy bits. Pattaya's location, just two hours from Bangkok makes it a popular weekend destination for people wanting to escape the big city. This in turn guarantees that there are plenty of hotels in just about every price category. When considering Pattaya for your beach destination, your first decision is about which area to stay in. There are two rather distinctly different sides to this destination. Pattaya itself is the more developed area, and where you'll find the seriously seedy bits. But, Pattaya is also where you'll find the big shops and other services. 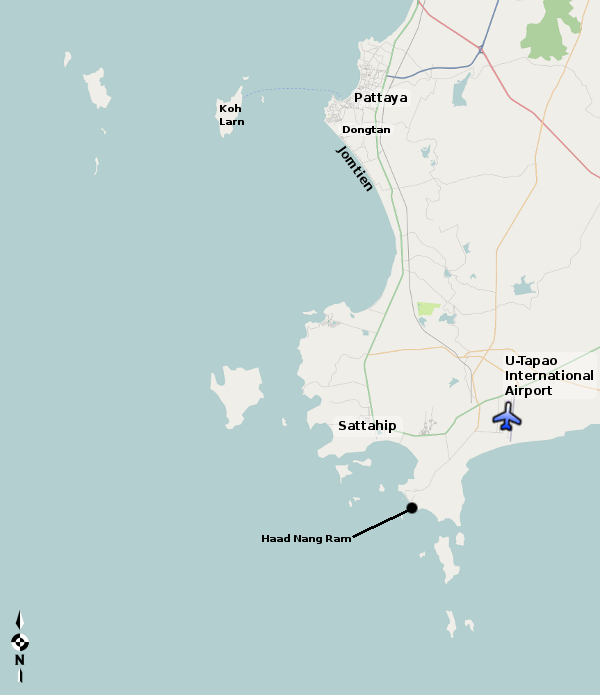 Just south of Pattaya, on the other side of a small hill, is the Jomtien Beach area. Jomtien is, generally, the more "family friendly" area, with very little of the seediness that typifies Pattaya. There are plenty of hotels to choose from, in all prices, as well as some very good restaurants, and it takes only 15 minutes or so to get into Pattaya if you really feel the need.